Before entering the NUGSE I was not fully aware of how family and work influence academic performance at university. “A person may find conflict between her role as a mother and her role as a student when her child’s demands for time and attention distract her from the needs of her studies” (Adofo, 2013, p.29). Therefore to meet the high standards at university I have to find balance and prioritize all tasks throughout all time. I had to set up dedicated times for studying and sometimes I find myself sitting next to my son and daughter and they occasionally simulate me: they sit in front of laptops for children, put books around, write notes and make serious faces. I could say that prioritizing and planning your time efficiently are main skills that online students have to learn quickly. Planning backward from deadlines, use of planner organizers, Google Scholar and Calendar – tools that ease life of online students. By using these instruments online students will meet deadlines and find scholar sources of information. Finding support from your family and close friends are important too. Distance learning takes time and students should definitely speak out if they face difficulties. I always ask for help if I need to and delegate some responsibilities to my family members. Also my advice for those students who have children: schedule bonding time each day for at least 20 minutes. I switch off everything from my head (work, studying, home responsibilities, and other thoughts in mind) and try to spend some quality time with children only by playing, reading books, going outside and other activities. Sometimes cuddling in front of TV works well too. Personally speaking, I think finding support from group mates are inevitable part of online process as well. Most of the time, we are chatting about recent news from NUGSE, assessment tasks and clarification about requirements. Additionally, we are as the group support each other and share good resources that could be useful for research. Looking back to one and half year of studying I could say that I feel lucky to meet and collaborate with my group mates. – Less intensive course. As the 2-year program has been specially designed for teachers-in-service, the content and load of courses should be accordingly less demanding. – More practical content. 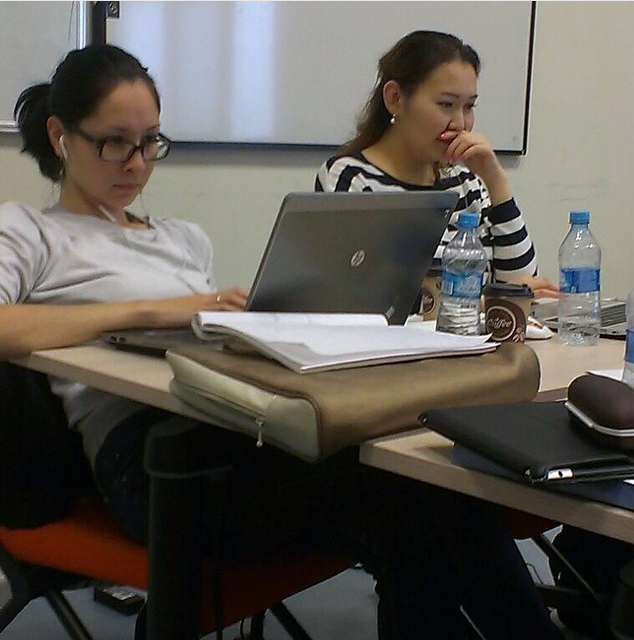 As Kazakhstani educational system is going through fast-paced reforms, the content of the online distance course could include strategies of how to deliver these reforms in classroom and how to become a ‘change agent’ (Fullan, 2007). Overall online students meet a lot of challenges. Some strategies include finding support from relatives and group mates, effective planning and use of up-to-date tools. Adofo, S. (2013). Challenges and Coping Strategies of Student Nursing Mothers in Tertiary Institutions in the Greater Accra Region of Ghana (Doctoral dissertation, University of Ghana). Fullan, M. (2007). The new meaning of educational change. Routledge. The research questions of my mini-scale study offered me a great opportunity to understand the factors influencing the students’ engagement during online learning. However during the data collection process I have faced different obstacles and understand some peculiarities of the process. The first challenge I faced with during the data collection process is number of participants. It was difficult for me to identify ‘the best’ number. On the one side, time schedule of online NUGSE students who are working are completely booked, and on the other side, I have to ask at least more than one student, in order to answer the research question and discuss findings. After consultation with the instructor I understand, that ‘ideal’ number from 2 to 5 students. Another step that is vital in the process of data collection is design and content of the interview protocol. All questions should be aligned with research question and sub questions. And if interviewee during the question session will start to discuss something different, it is important to return him/her back to the track by asking a leading question. For this reason, I prepared set of probing and posing follow-up questions that will provide information about participants’ opinion about online students’ engagement. The interview protocol allowed the communication to be more spontaneous, and by observing the reaction of interviewee, (like tone of voice, pauses and etc.) I could drive more deeply understanding of participant’s feelings. And of cause, this process requires more concentration from me. Both mini-scale study and proposed thesis research projects have qualitative research approach and an interview protocol as instrument. It was intentionally made for several reasons. First reason is that by employing the same methodology I could probe and test on small scale and avoid the ‘big’ mistakes during the proposed thesis. Next reason is that during my Bachelor studies I used quantitative approach many times, our professors frequently asked us to conduct questionnaires and analyze the finding using software. Therefore I decided to understand the nature of qualitative approach this time and enjoy the conversation with participants of the study. I could personally claim that conducting the interview and using the data collection instrument contain many unexpected advantages and disadvantages. The nature of qualitative approach let researcher to gather more information from one-to-one interviews. However it is important to be focused in order to answer the research questions. Recently our school implemented a new platform for collaboration – Padlet. I have never used this application before, so currently I am still on the learning curve and exploring all benefits of the platform. Even when I was watching the YouTube video “Padlet’s Many Uses for the Classroom” I have learned and discovered new options of the application. One of the many reasons, why the school decided to test this year the effectiveness of this online technology is another innovative idea of improvement in school communication – Academic Leadership. Each teacher at NISA is academically responsible for 8 assigned students elected by random choice. The main responsibilities of Academic Leaders are to work collaboratively with students via Padlet walls reflection, to trace students with low academic performance by reviewing grades and reports from teachers, to collect and support students in performing Service and Action projects as inevitable parts of Middle Year Program of International Baccalaureate. Therefore the plans of using Padlet at the school are enthusiastic this year. By exploring Padlet further, it becomes clear that application could be used in classroom too. Teachers have opportunity to prepare a wall with content (images, videos, texts and other useful resources) and easily teach students about specific topic. Or teachers could create a wall and share the link to all students for brainstorming ideas or reflecting on lesson’s outcomes. Free access to everyone is financially beneficial too. One of the obstacles that I face with during the last two years is number of Economics lessons per week. We have just one hour (60 minutes) of Economics per week in 10th grade and as consequences it is difficult to teach the content in greater depth and leave the time for reflection. I will try to use the application as extension of the lesson and ask my students to comment or reflect on certain subjects after the lessons. Overall, the development of technology brings a lot of new opportunities during and in-between the lessons. Padlet could be used as the new platform for improving communication between academic stakeholders. Also it could be applied as the function technology during and after the lessons. From the beginning, it is perhaps useful to mention that the purpose of the literature review is to structure a foundation that will support my research about women leadership in multicultural environment. I started to organize the main themes by the central ideas identified in the scholar articles and books about women leadership. There are many articles about topic related to my research questions and by organizing key studies thematically I will have opportunity to structure the theories and concepts in logical body. As the topic about female leadership in multicultural environment will be developed in the literature review, I decided to systemize the sources by concepts: from general principals to the specific discrete pieces of information. For smooth linking of the main ideas I think it will be a good strategy to build and connect concepts together on one another. By doing this the readers could easily follow the sound logic of my writing. During the stage of collecting scholar books and journals related to the topic I was faced with several problems. To be more specific it was difficult to identify the key words. Due to the differences in languages I discovered that in American resources “leadership” occasionally used as “superintendence”. Another word is “multicultural”. This term includes the diverse meanings from different ethnicities and cultures to social-economical background and inclusive education. Currently I am analyzing and identifying the main ideas presented in the articles and books. I am filling in a mind map (and a table) where I classify and categorize the main concepts. Before that I was given recommendations from my supervisor about appropriateness of my sources. Overall, I could state that the procedure of structuring the literature review could not be identified as straightforward and easy process. Finding the accurate scholar article by key words, organizing the main ideas in purposeful and meaningful structure are complications that will help every master student to develop necessary research skills. Many academic papers were written in accordance with APA style. This manner of presenting your ideas is very important, especially nowadays. The flow and access to information increased dramatically, researchers publish and share their findings electronically. Therefore commonly used standards (like APA) in formatting, referencing, structure and punctuation are widely recognized around the world. APA standard in communication is important for other reasons as well. Personally speaking, as the teacher and the student, I have to recognize and use the rules of APA style on a daily basis. So I could improve my understanding and skills with my students as well. Another reason for increasing the common notion of APA style is acceptance among academic personnel of the school. During the former academic year the school had made a decision to revise and improve school’s policies. I was honored to be in a focus group, which was responsible for academic honesty policy. We engaged different stakeholder groups of the school’s society and brainstormed common understanding and strategies for promoting academic honesty. Some of the methods were developed for the new students and currently hired personnel. For instance, new comers usually participate in specially designed professional development sessions. At the same time, a decade ago schoolchildren have not been taught how to cite and most important for which reasons. We were asked to research on specific topics and collect information from books and encyclopedias and present our finding. However, the valuable part of this process was missing: giving credits. As the obvious consequence, these schoolchildren as adults are struggling now and have to relearn and develop the necessary skills in citation. With the help of technology, APA style could be followed by many programs for keeping track of information, quotations from different sources. Many databases are specially organized for keeping track of used sources. Establishment of the common APA standards in presenting ideas is definitely simplified the life and all efforts should be placed in order to follow them. Online learning environment is a set of teaching and learning platform for digital aspects of education. Growing number of online learning courses convey strengths and drawbacks. Different authors evaluate the value of the virtual learning. Oncu and Cakir (2011) argue that online learning environments have a promising future for all stakeholders of educational process, including researches, practitioners, and learners. The investigation called “Research in online learning environments: Priorities and methodologies” focuses on four research goals and matches four existing methodologies to improve student outcomes in online learning environments defined as learner achievement, engagement, and retention. In order to accomplish these research goals, formative research, developmental research, experimental research, and activity theory methodologies were recommended by authors. The first two types of research methodologies are mainly appropriate to improve the quality of designed online courses; experimental studies are useful to compare the effects of different teaching methods that influence learner outcomes. Robinson and Hullinger (2008) identified the reasons for an increase in the implementation of Internet-related technologies. Besides the authors used vital engagement dimensions that the National Survey of Student Engagement (NSSE) defined to measure student engagement in online courses from 3 universities. According to the findings of the article the online curriculum should dynamically engage students through challenging academic rigor, consistent and timely student–faculty interaction, a collaborative learning environment, and activities that enrich the development of the student. The present findings serve to encourage the application of the concept of engagement to improve the quality of online instruction. From the personal point of view the development of online learning opens the new chapter in education. We all hear about the necessity to meet not only the needs of our students’, but also about the value of alignment between education and real life, more specifically how to apply learned skills in the daily life. Some challenges that digital learning creates are engagement and motivation of the students. Due to flexibility in the format, learners could easily be distracted from the online courses. Another challenge is providing valuable feedback from instructors. Online education has a vast majority of advantages as well. The opportunity to be educated from the distance cuts living and travelling costs for both educator and learners, and expands a time management schedule. For me it means spend more time with my family and children. Robinson, C. C., & Hullinger, H. (2008). New benchmarks in higher education: Student engagement in online learning. Journal of Education for Business, 84(2), 101-109. During the first fall session of English for Professional Purposes course instructors challenged us by giving unusual assignment. The purpose of this assignment was to familiarize us with various resource materials and learn how to cite them correctly. The sources were: books, magazines, websites, journals and film. At that time I have seen just few films about education, including the plot of the drama film “Mona Lisa Smile”. The main character Katherine (teacher at Wellesley College) was advocating that women should actively seek opportunities to be not just good wives and mothers, but also add to this balance career. Investigating the other academic sources I discovered variety of materials, however professional characteristics of the leaders are widely and commonly known, since the analytics entirely covered many characteristics of people in charge. However the personal qualities of the female leaders in school environment are still needed to be investigated. Korcheck (2002) observed that “women can creatively manage and manipulate available resources, transferring their energies to laterally extend their influence into other areas” (p.25). I agree with the author that female leaders have their own outstanding and unique characteristics, which could be applied effectively in the school environment. According to the research conducted by White and Smith (2012), the professional characteristics of women in leadership positions range from higher in the cluster of trust, with the cluster organization as the second highest rated, the third cluster was drive, the fourth cluster was interpersonal, and the fifth and lowest rated leadership attributes cluster was tolerance. I agree with the authors, that the potential leaders needed to be recognized according to the characteristics, so they could be trained on time and be promoted accordingly. From the working experience I realized the importance of role models or mentors. As the new teacher I am seeking for right decision making techniques from different sources. It could be my colleagues, books, the internet. As Ann Francke, chief executive of the Chartered Management Institute, said that women need “the so-called idols and those that are writ large across the night sky, and then we can have the accessible ones. They can teach us how to do things and instill a belief that we too can achieve great things” (Prevett, 2014). 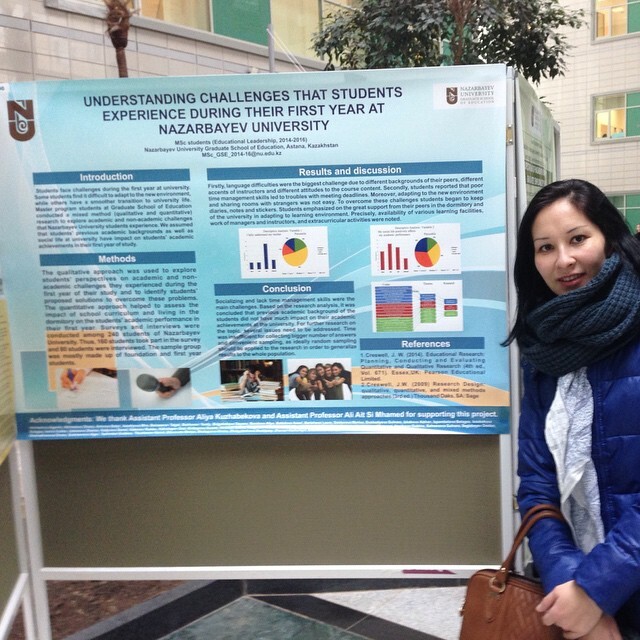 Therefore the purpose of my thesis is to reveal from the interviews of women leaders unexplored data about various aspects of their work lives in Kazakhstani schools with diverse culture environment. Their personal reflections will contain professional virtue that will promote and facilitate women leadership. The experience of the first year gave opportunity to discover different edges of educational system all other the world. We were lucky to be educated by diverse representatives of academic field at NUGSE and I am looking forward to continue this year of study. Johanson, F. (Producer), & Newell, M. (Director). (2003). Mona Lisa Smile [DVD]. Colombia Pictures. White, T., & Smith, B. (2012). Career and Technical Education Secondary Female Teachers: Leadership Attributes. The University of Georgia. Retrieved from ERIC database. (EJ995892).